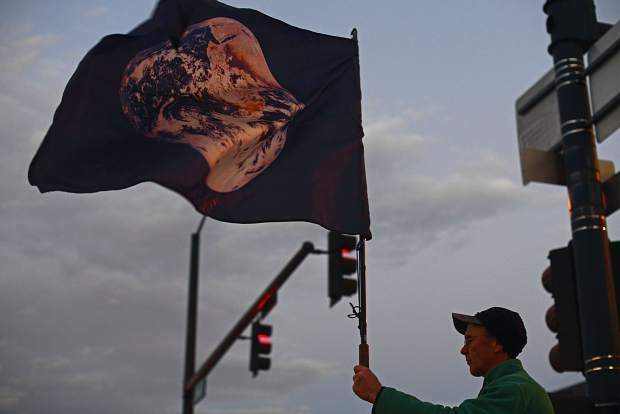 A protestor waves an earth flag outside the Alfred A. Arraj Courthouse in downtown Denver during a protest supporting a case to give the Colorado River personhood. 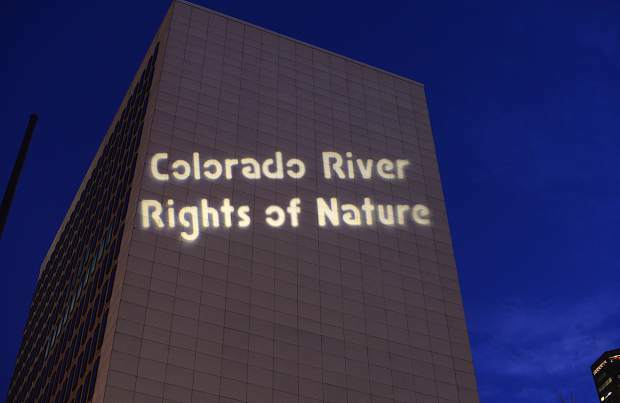 Protesters cast the words Colorado River Rights for Nature onto a building near the courthouse using a projector. Protestors carry signs outside the Alfred A. Arraj Courthouse in downtown Denver during a protest supporting a case to give the Colorado River personhood. 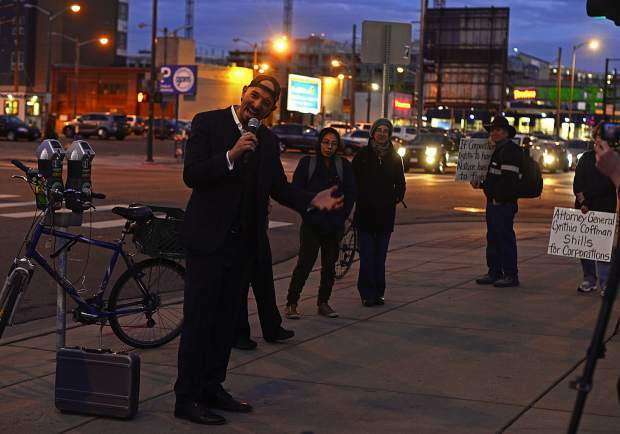 Jason Flores-Williams, the lawyer representing the Colorado River, speaks to protestors outside the Alfred A. Arraj Courthouse in downtown Denver. 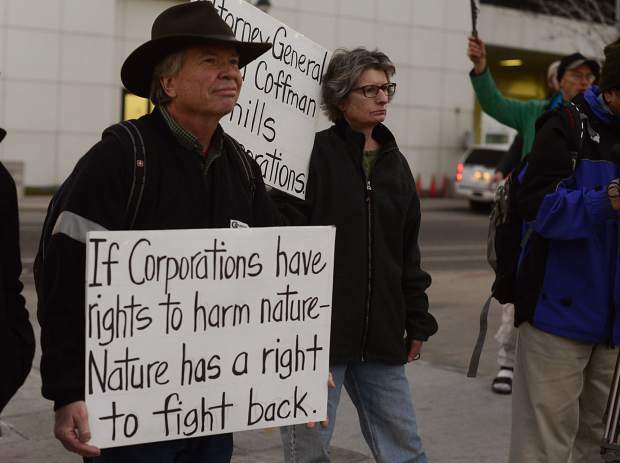 DENVER — Protestors spurred on by the environmental group Deep Green Resistance gathered at dusk in front of the Alfred A. Arraj Courthouse in downtown Denver Friday. High above their heads, the words “Colorado River Rights of Nature” loomed, lit by a spotlight projector placed outside the protester circle. The activists had come in support of a first-of-its-kind lawsuit in the U.S., the Colorado River Ecosystem v. the State of Colorado, which seeks to grant direct rights to nature in the United States. 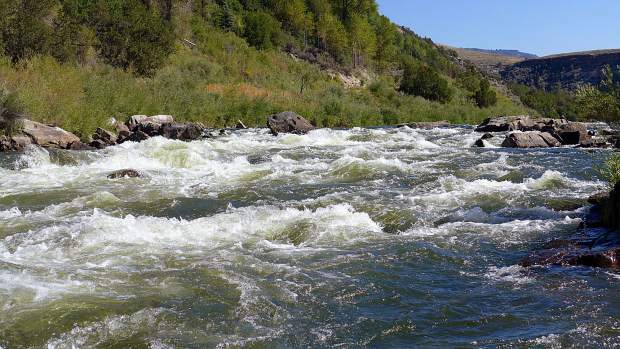 If successful, the case would allow anyone to file a lawsuit on behalf of the Colorado River ecosystem, including all the river’s tributaries. And even as the protestors gathered on Friday, the attorney general’s office filed a second motion with the federal court to dismiss the lawsuit. A Dec. 1 deadline to do so had been set by the court in response to an amended complaint filed by the plaintiffs on Nov. 6. But Friday’s protest was in response to a Nov. 16 letter sent by the Colorado attorney general’s office. The state’s attorneys threatened that if the plaintiffs did not withdraw the case they would file sanctions against Jason Flores-Williams, the lawyer representing the Colorado River and its “next friends” — members of Deep Green Resistance and others that have been appointed to represent the river’s interests. 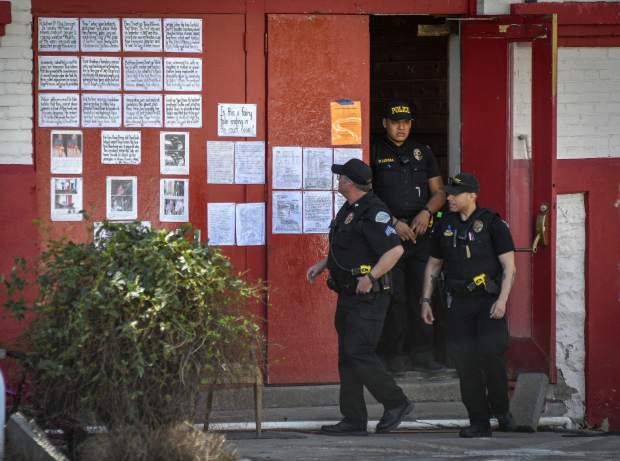 Sanctions could range from censure to disbarment and could bill Flores-Williams for the hours incurred by the attorney general’s office while managing the case. Responding to an interview request, the attorney general’s office declined to comment on its letter threatening sanctions. On Friday, standing before the crowd in a blue plaid suit and a backwards baseball cap, Flores-Williams reaffirmed that he would go forward with the case despite the sanctions at stake. “They thought that by trying to intimidate me they would intimidate the rights of nature movement, instead it is going to invigorate it,” Flores-Williams said in a previous interview. 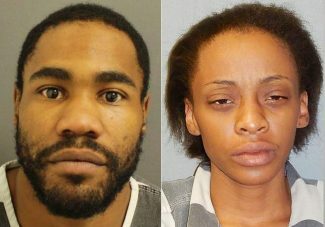 On Nov. 28, Flores-Williams had responded to the attorney general’s office with an open letter. “Lacking actual legal grounds, the attorney general’s letter can only be understood as an attempt to harass me and silence the rights of nature movement,” said Flores-Williams’ response. The pursuit of sanctions is a severe and rarely used tactic that courts will use to punish a lawyer for bringing a case with no real standing, and while Flores-Williams has rebutted claims that the case is frivolous, there is confusion over what exactly the plaintiffs are asking for in the lawsuit. Flores-Williams and the environmental groups aligned with him have made no secret about their intentions to build a movement around their case. Though this lawsuit looks only at the Colorado River ecosystem, its underlying implication is that nature should have rights in the same way people — and often corporations — do under U.S. law. But the state’s second motion to dismiss argues again that the lawsuit filed by Flores-Williams violates the Eleventh Amendment, which bars private citizens from suing states in federal court. The state also says neither the Colorado River ecosystem or the “next friends” listed in the lawsuit hold legal standing. The idea of rights of nature dates back to at least 1972, when lawyer Christopher Stone published the article “Should Trees Have Standing?” in Southern California Law Review. The article caught the eye of Supreme Court Justice William O. Douglas, and that same year he heard the case Sierra Club v. Morton, where the Sierra Club sought to block the construction of a ski resort in California. 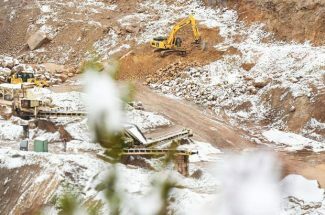 The court ruled that because the Sierra Club did not allege a specific injury that the ski resort presented to the club, that it lacked legal standing. But in a dissenting opinion Douglas asserted that nature itself should have standing. 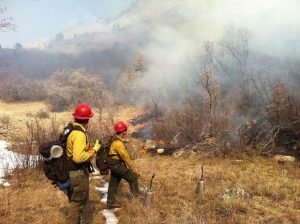 Legal efforts to establish rights of nature have made some headway in some states, but Colorado courts have continuously struck them down. “Colorado is maybe the worst of the western states to have this conversation because in some respects we are further behind than everybody,” said Doug Kenney, the director of the Western Water Policy Program at the University of Colorado. In Colorado, this type of legal thinking is particular sensitive with water resources in particular due to the state’s complex and deeply entrenched system of water rights. Many legal experts believe the rights of nature case has little chance of going forward, but it does come at a pivotal moment for the future of managing the Colorado River. 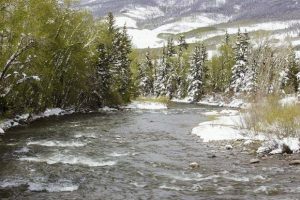 Editor’s note: Aspen Journalism is collaborating with the Glenwood Springs Post Independent, The Aspen Times, the Vail Daily and the Summit Daily News on coverage of rivers and water. More at aspenjournalism.org.